This is by far my most favorite holiday. I have always loved that on this day you can pinching strangers and it's weird/funny to see everyone wear green. Each year we add new "traditions" to it. 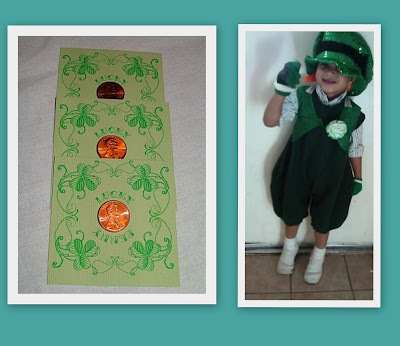 Owen was a Leprechaun for Halloween and when he found out that a mischievous leprechaun was sneeking around our house this morning he wanted to get in his old get up and do some sneeking of his own. At 9am this morning I was digging out the Halloween stuff. It was well worth it! I am very lucky to call this cute little man my son! 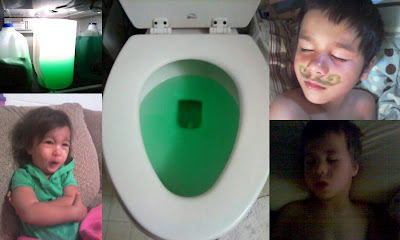 He dyed the milk, lemonade and water green. Even the toilet water. He painted green mustaches on the boys and swirls on Lilia's cheeks. Thanks to my sister Tonya and friend Becca for letting me know what goes down in their homes so I could make our home was Leprechaun friendly! Nifae and Owen had so many things to say. I wish I could remember it all. I kept saying that the leprechaun was naughty and finally Owen said, "No him not! His super silly!" Anyway, he was even shocked that the silly little man had dyed his makapiapia (eye goobers) green. GROSS!!! Anyway, we have had a fun day. Hope you are, too!